The road to Hadley having her own bedroom has been long and tumultuous. A little back story: when we moved into our current home, Hadley was only 6 months old. She was still in a crib, still taking 3 naps a day, still only semi-mobile. Her room, while relatively small, worked for her because she was still so small. As she grew, the room began to shrink and when she moved into a “big girl” bed, we made the decision to move her into a shared room with her brother and turn her room into a playroom. For a little over a year, it was fabulous. The layout of Evan’s room was perfect for a shared bedroom and all the toys were in the playroom which was glorious. The demise of the room came in that I have two very different kids. My son is an early bird who prefers to play with others, while my daughter is a night owl who values her independent play. Despite our best efforts, she always viewed the room as “his” room, not theirs, so the writing was on the wall that a change needed to be made. The question was when and how that change was going to occur. The perfect timing for that change came during our summer travels. We do not live close to family so each summer I load up the kids and the dog and we split the time between my parents’ home in North Carolina and my in-laws’ home in Massachusetts. It was during this time that my husband, who stays in Florida for work, decided to have the interior of our house repainted. Down came all the pictures and furniture was moved. When it was time to put it all back, he simply moved her stuff to what had been the playroom and separated all the toys. It was a chore, no doubt, but the look on her face when she came back home to her own room made it all worthwhile. Chalkboards made by Chalkfull of Design. We have the shapes, numbers, letters and personalized name boards. The bonus of these is that command strips on the back allow them to be functional educational materials turned wall decor. Lots of peg dolls by Teeny Weeny Toys including the Rainbow Sorter Set and the School Bus set that was featured in our Back to School post. Our goal with this room was to make it functional and fun without being completely disorganized, which is especially important in a small room. The toys left out in the open serve as both decoration and invitation as they are all toys that encourage open-ended, quality play. Toys like the peg dolls, the dollhouse and the Picasso Tiles can all be used together or separately, but encourage one to use their imagination rather than placing limits on the play. 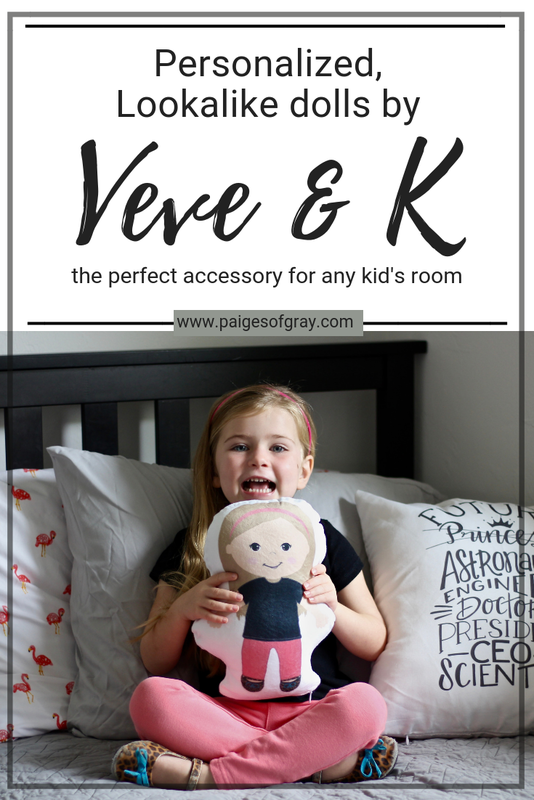 By far the winner in the new room was the adorable personalized lookalike doll by Veve & K that sat on the bed awaiting her return. The custom doll features a cartoon caricature of Hadley on the front and a unicorn, her name and her age on the backside. It’s super soft and cuddly which may be the reason why the doll hasn’t left her side since she received it. It was a great way to celebrate her new room and it will be a cute memento to have of this time in the future.